Do you ever sit there and wish a bowl of all things sweet could be good for you, too? What if I told you such a bowl exists, and it provides a good amount of fiber, protein, and carbohydrates to adequately fuel you for your busiest days! I had my first açaí bowl at Blenders and Bowls in Austin late last year, and it changed my life. I had to learn how to make it! Açaí (pronounced ah-sigh-ee) is a fruit that grows 20-60 feet high on palm trees in Central and South America. Since they perish quickly, after they are harvested, they are found in health food stores frozen and in powder form. This fruit is a rich supplier of antioxidants, fiber, Vitamin A, Vitamin C, and heart-healthy omega-3 fatty acids. 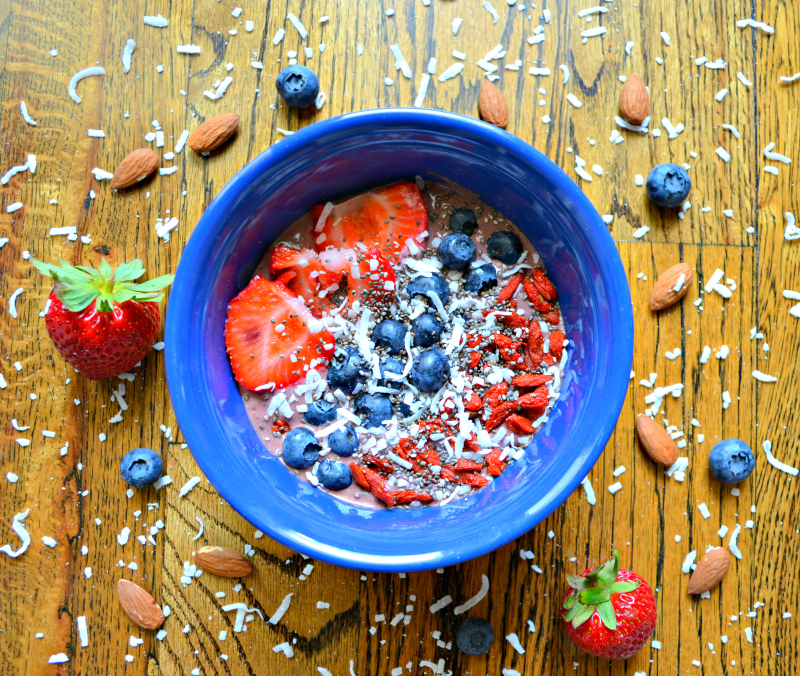 In this bowl, I blend açaí with fruit and protein-packed Greek yogurt and almonds, and pour that into a bowl. Then, I sprinkle the blend with more fruit and other nutrient dense toppings, like chia seeds and goji berries, to increase the fiber and protein content to make it more of a complete meal! Let's whip up a bowl! 1. Blend all of the ingredients together. Pour the açaí blend into a bowl. Place fruit on top, and sprinkle the coconut flakes and chia seeds on top. Enjoy all of these benefits below!! I hope everyone enjoyed their holiday weekend!! My great friend, Jessica, visited from Florida, so, of course, lots of exercise, eating, dancing, and relaxing by the pool was done and then repeated. :) My mom is here for one more day, so I am going to hug her all night, and, hopefully, find her a dress for my sister's wedding in October. I am so grateful for these moments with my loved ones! Happy Tuesday!! Make it a great one! !